"I tried never to forget who I was and where I’d come from and where I was going back to … After nearly eight years in the White House and 10 years in the Senate, I found myself right back where I started in Independence, Missouri." When he left office, President Harry Truman’s approval rating was down to only 30 percent, but with time, estimation of his contributions as president has changed. A recent poll of historians ranked him the fifth-greatest president, behind Abraham Lincoln, George Washington and the two Roosevelts. Who was this man who came from nowhere, a man who would have been content to be a Missouri farmer married to Bess Wallace? The people of Independence are prepared and eager to answer that question. Truman was a product of his life in Independence, and the town played a large role in what he became. Few U.S. cities have so many places associated with one president. It was here he courted and married Bess, had his home, started his career and had a museum and library dedicated to him. On May 3, 2003 a ceremony opened a walking trail that stops at 44 places in Independence associated with Truman. Before everyone expected presidents to jog to stay healthy, Truman was famous for his fast-paced long walks, so it is fitting that a trail has been developed to commemorate his contributions. The self-guided Truman Historic Walking Trail travels past his friends’ homes and the major sights Truman would have seen on his daily walks. It includes a couple of trees, one a ginkgo tree he used to talk to on his walks. He would say to it as he passed, "You’re doing a good job." Visitors should begin at the Offices for the National Park Services in the old Fire Station No. 1 at Truman Avenue and Main Street. There is a brochure for the self-guided tour. A 12-minute narrated slide show, composed of pictures from the family archives, gives a background of their lives in the Truman House. Here, tickets are sold for a guided tour of the house five blocks away. The house was declared a national historic site in 1984, two years after Bess’ death. National Park Service personnel conduct the tours of the house; they can answer questions on many aspects of the house’s and the family’s history. Only eight people at a time are allowed into the house for the tours — 32 a day, each 15 minutes long. The house, which receives 45,000 visitors a year, has been left just as it was when Bess died. Only the first floor is open for tours, but it gives a taste of the lifestyle of a remarkable American. Truman’s hat and coat still hang in the hallway. Of special interest to me was his well-stocked personal library. He had only a high school education but was a voracious reader. Included on the walking tour is Trinity Episcopal Church, where the Trumans were married in 1919 after a nine-year courtship. He was 35, she 34. In letters, he claimed he had been in love with her since he was 6 and she was 5 when they met in Sunday school. Bess’ mother, who came from a genteel family, was not enamored of her lovely daughter marrying a man like Harry, who had no prospects. Besides, in the early days of the century, the church you belonged to indicated your social status. Truman was a Baptist, and Bess was Presbyterian, a wide social divide at that time. 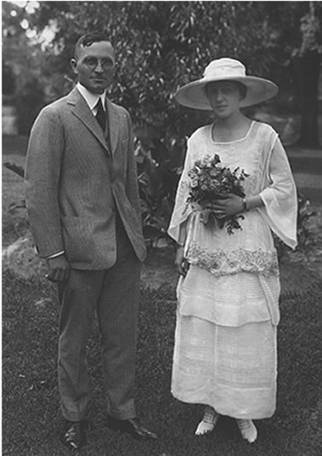 Their daughter, Margaret, was married in Trinity Episcopal Church, and Bess’s funeral was there. 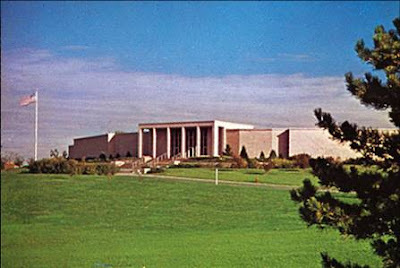 The couple is buried in the courtyard of the Truman Library-Museum, which is also on the tour. Truman, who died at age 88 in 1972, made the arrangements for his own funeral. "It’s going to be a mighty fine show," he said. "I’m sorry I’m going to miss it." 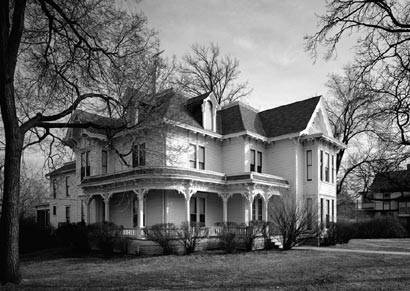 The Truman family left the farm at Lamar and moved to Independence when Harry was 1 year old. When we went by the house, the owner was out mowing the lawn. I suspect he gets a bit annoyed with people constantly dropping by and taking pictures. On the other hand, the lawn and the house were in good condition, so he might be doing something to keep the tourists happy. We were told the house has been changed since Truman’s parents lived there, and the area surrounding it is no longer filled with the cows, horses and chickens that were the property of his father, who was a dealer in livestock. A plaque marks the house of a reporter, Sue Gentry from the Independence Examiner, a good friend of the Trumans who often got inside scoops. The Clinton Pharmacy, where Truman got his first job for $3 a week, still stands in downtown Independence, not far from the courthouse where he worked as a judge. At the courthouse, which houses the Truman Courtroom, a statue of Truman stands on one side and one of Andrew Jackson is on the other. A 35-minute film discusses the events that influenced his thinking and helped shape his character. Guides at the visitor’s center or the Truman Home can tell many stories about the family. For example, when Truman first campaigned for the Senate, he didn’t have money for hotels and was forced to sleep in his car. Another story involves a close friend whom Truman asked to bring his shotgun and come over to shoot the pigeons around his house. When the man came over and began to shoot, it alarmed the Secret Service men who had been assigned to protect Truman after his presidency. The Truman family farm, which he operated from 1906-17, is part of the Harry S. Truman National Historic Site and is 20 miles south of Independence. In the third room of the Franklin Delano Roosevelt Memorial, there is a large sculpture of Roosevelt with his dog Fala. The artist conveyed the president with a tired look meant to convey the demands the war had placed on him. WASHINGTON, D.C. - As it was a hot day in the nation’s capital, I almost passed up visiting the Franklin Delano Roosevelt Memorial because it was some distance from the other memorials that I wanted to visit on the National Mall. Skipping the memorial would have been a big mistake. It is unusual for me to visit a site without reading something about it first, but I hadn’t done my homework. I didn’t know what to expect, and I thought the first room was the whole memorial, with its sculpture of Roosevelt sitting in his wheelchair. When the memorial was erected in 1997, disability activists complained that it didn’t show him confined to a wheelchair, a result of polio in 1921. This illness had been an important factor in who he was and what he had to overcome to serve as our 32nd president from 1933 to 1945. Eleanor Roosevelt said, "Franklin’s illness…gave him strength and courage he had not had before. He had to think out the fundamentals of living and learn the greatest of all lessons - infinite patience and never-ending persistence." As he wanted to project an image of strength in the difficult years of depression and war, he went to great lengths to ensure that in public his wheelchair was never shown. However, as attitudes had changed, the original designers responded to the protesters and added the statue of him in a wheelchair in 2001. Once I stepped beyond Room 1, my response was, "Well, this is tremendous." The series of waterfalls, massive red granite rocks, striking sculptures, quiet pools and words of wisdom from Roosevelt engraved on the walls combined to form the most impressive memorial for an individual I have ever seen. What are called rooms are granite-walled, open spaces with lovely waterfalls or fountains and a minimum of objects, making those that are there much more meaningful. The rooms stretch along the Tidal Basin across from the Thomas Jefferson Memorial. I had the feeling of walking through several secluded spaces in contrast to standing earlier before an imposing structure such as the Lincoln Memorial. Designer Lawrence Halprin set up the memorial as a series of five spaces, the first a Prologue Room and four other rooms, one for each of Roosevelt’s terms in office. The room commemorating his second term had the most impact on me. Here in a bread line stand five sad-faced figures obviously embarrassed by their plight. Nearby are an elderly couple who look hungry, and some distance away a man leans toward his radio as he listens to one of Roosevelt’s inspiring fireside chats. About 30 percent of workers were unemployed in the early 1930s. As a child, I remember pulling my little red wagon as I walked downtown with my mother to pick up food from the relief place. She was embarrassed that we couldn’t produce enough food in our own garden but would deal with the shame if it meant food for my brother and me. My father earned some money that helped us survive working for the Works Progress Administration. Making work and food available for us was credited to Roosevelt. Along with our relatives and neighbors, my parents considered him one of America’s greatest men; and the Social Security program was among his many social and economic reforms. In a third room is a large seated figure of Roosevelt, his shoulders covered in a robe, and his Scottish terrier Fala at his feet. The artist has captured the tired look that was the result of the demands the war placed on the president. In the fourth room is a magnificent statue of his wife, Eleanor, who did so much for human rights and often pushed Franklin into making decisions that benefited minorities. One of the 21 quotations inscribed on the walls particularly impressed me. "I have seen war … I have seen war on land and sea. I have seen blood running from the wounded … I have seen the dead in the mud. I have seen cities destroyed … I have seen children starving. I have seen the agony of mothers and wives. I hate war." Having been in trauma zones helping after the devastations caused by war, I am in complete agreement. A re-creation of the living room in Hoover’s suite at the Waldorf Towers at the Herbert Hoover Presidential Museum and Library. Herbert Hoover Presidential Museum and Library in West Branch, Iowa, was an eye-opening delight. 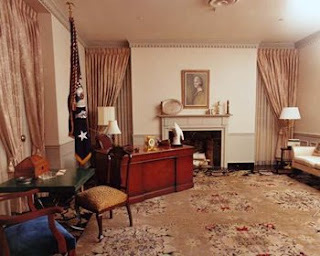 Only one other presidential museum, that of Gerald Ford, has done as much to show me aspects of a president I had not known before. Hoover had to have been one of the most talented men to become president, and one with one of the poorest reputations. It is a clear example of how presidents can be blamed for events over which they have little control or disasters that were actually set up by previous administrations. What is often seen as a failed presidency was only 5 percent of a truly remarkable life; and as you walk past the displays detailing his life, it feels like you are walking through a Horatio Alger novel. This is the remarkable story an orphan’s rise to great heights through a combination of talent, hard work, historical context and a bit of blarney at the right time. Hoover’s father died when he was 7; his mother when he was 10. The three Hoover children were split up, and he was sent to a stern uncle in Oregon. He later got into Stanford University and studied engineering. When he saw a job listing for a job calling for a much older man, he grew a mustache, bought a fancy suit and passed himself as older. He was sent to Australia, where he discovered he had a talent for finding gold and working with miners. The company sent him to China, where his skills continued to bring him attention and the opportunity to travel widely around the world. His wife, Lou Henry, and he lived in China long enough to speak the language, and they continued to speak it when they didn’t want others to understand what they were saying. Hoover became very rich and felt, probably because of his Quaker upbringing, that there was more to life than making money. He wanted to be involved in humanitarian activities. Because of the climate of World War I, Belgian children were starving to death. With the cooperation of the Germans and Allies, he made arrangements to get the facilities to bring in food. After the war, he was placed in charge of the program to prevent massive starvation in Europe, and he showed great organizational skills in getting the job done. In 1928, he won the presidency by a landslide. Nine months later in November, the ax fell, and the market collapsed. He couldn’t dent the problem and was blamed for it continuing. Franklin Roosevelt beat him in 1932 and he went into forced retirement in disgrace. After World War II, Harry Truman asked him to again help with the recovery in Europe. He was called the Great Humanitarian. In the museum, old people who were survivors of famines after both wars give testimonials on one monitor to what hunger does to people and how important Hoover’s work was. Herbert Hoover as fisherman, one of his favorite pastimes. He was the first president to use radio, and one section plays some of his speeches, and another section uses three monitors to give his inauguration. One room of the exhibit is a replica of his office in the New York Waldorf Towers, where he lived for 25 years. In the room is his color TV set playing interviews he had with various newsmen. Life-sized figures throughout show him as various ages, as a 10 year old, a young engineer, a man of wealth and as president. Hoover’s father’s blacksmith shop has been restored.